Is A Major Rally In Gold & Silver Mining Stocks About To Emerge? When looking at the Philadelphia Gold and Silver Index (XAU), an index comprised of sixteen precious metal mining companies, it appears that a multi-year bottom has likely been made. 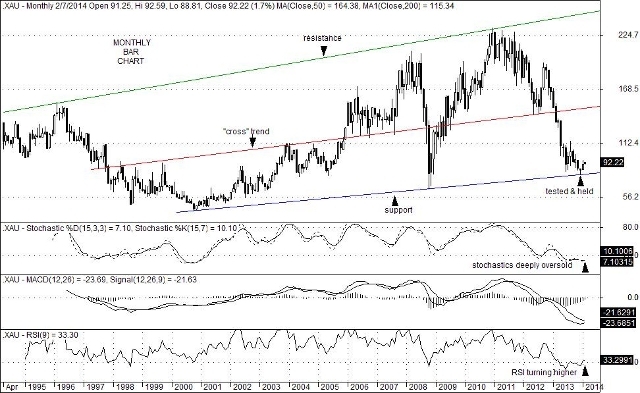 A test of long-term trend line support at 79.73 was made on December 19 and has resulted in a 15.7% advance to 92.22 by the close of trading last week. That being said the upside potential of this turn-around in mining stocks may have only just begun. On monthly bar charts, stochastic technical oscillators remain in a deeply oversold condition, with the corresponding Relative Strength Indicator (RSI) just beginning to turn higher from relatively weak readings. Moreover, the upswing since the December low only represents an 8.13% rebound of the steep 232.72-to-79.73 drop that began in December 2010. With gold and silver holdings clearly out-of-favor at the moment, the formation of two new private equity ventures last week combined with a number of existing buyout groups eying cash-strapped mining companies could trigger a revival in acquisitions or possible partnerships. To date, a number of large gold and silver companies have already begun the process of selling under-developed projects in order to reduce debt levels and lower maintenance costs since traditional borrowing sources have steered away from this area in recent years. That, of course, was due to the severe drop in precious metals prices that began in September 2011. Nevertheless, the long-term chart of the XAU suggests that metals and mining stocks are now at bargain prices with basing technical patterns starting to develop on shorter dated time frames. If so, much more upside appears likely for the XAU in the months ahead. This entry was posted on Wednesday, February 12th, 2014 at 2:10 pm	and is filed under Philadelphia Gold/Silver Sector Index (XAU). You can follow any responses to this entry through the RSS 2.0 feed. You can leave a response, or trackback from your own site.